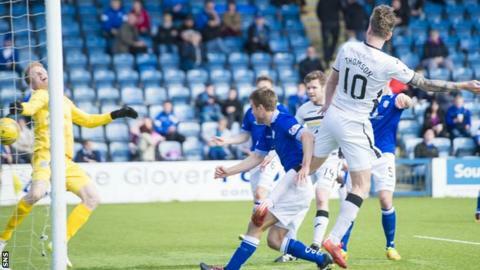 Robert Thomson nodded the winner as Dumbarton beat Queen of the South to boost their survival hopes. Stephen Dobbie gave the home side the lead with a fine finish but Sons soon hit back. Goals from Sam Stanton and Thomson before half time gave them a lead they would not surrender. The win takes Dumbarton into seventh spot in the Championship, three points above the relegation play-off spot and five clear of bottom club Ayr United. The first half was an open affair and Dobbie produced goal 24 of a prolific season with a clinical finish, turning sharply and shooting past Alan Martin after 15 minutes. That lead lasted just five minutes, though. John Rankin brought down Lewis Vaughan at the edge of the box and Hibs loanee Stanton produced a stunning effort to score past Lee Robinson. Thomson netted the winner after 39 minutes, rising at the far post to nod Christian Nade's cross beyond Robinson. The second half was as dull as the first was exciting, with Dobbie and Thomson trying their luck with no joy. Gregor Buchanan should have made it 3-1 in 80 minutes but he was unable to find the net with his header. Match ends, Queen of the South 1, Dumbarton 2. Second Half ends, Queen of the South 1, Dumbarton 2. Corner, Queen of the South. Conceded by Daniel Harvie. Substitution, Dumbarton. David Smith replaces Andy Stirling. John Rankin (Queen of the South) wins a free kick in the attacking half. Foul by Mark Docherty (Dumbarton). Ross McCrorie (Dumbarton) wins a free kick on the left wing. Andy Stirling (Dumbarton) wins a free kick in the defensive half. Substitution, Dumbarton. Mark Docherty replaces Lewis Vaughan. Lewis Vaughan (Dumbarton) wins a free kick in the attacking half. Lyndon Dykes (Queen of the South) wins a free kick in the attacking half. Kyle Jacobs (Queen of the South) is shown the yellow card for a bad foul. Robert Thomson (Dumbarton) wins a free kick in the defensive half. Attempt missed. Gregor Buchanan (Dumbarton) header from the right side of the six yard box is close, but misses the top right corner. Robert Thomson (Dumbarton) wins a free kick in the attacking half. Attempt missed. Dom Thomas (Queen of the South) right footed shot from outside the box is too high. (Queen of the South) wins a free kick in the attacking half. Foul by Lewis Vaughan (Dumbarton). Substitution, Dumbarton. Garry Fleming replaces Christian Nade. Attempt missed. Robert Thomson (Dumbarton) right footed shot from outside the box is high and wide to the right. Foul by Ross McCrorie (Dumbarton). Foul by Dom Thomas (Queen of the South). Daniel Harvie (Dumbarton) wins a free kick in the defensive half. Attempt saved. Stephen Dobbie (Queen of the South) header from the right side of the box is saved in the bottom right corner. Hand ball by Lyndon Dykes (Queen of the South). Delay in match Darren Barr (Dumbarton) because of an injury. Foul by Samuel Stanton (Dumbarton). Substitution, Queen of the South. Daniel Carmichael replaces Connor Murray.